Staten Island /ˌstætən ˈaɪlənd/ is ane o the five burghs o New York Ceety, in the state o New York, in the Unitit States. In the soothwast o the ceety, Staten Island is the soothmaist pairt o baith the ceety an state o New York, wi Conference House Park at the soothren tip o the island an the state. The burgh is separatit frae New Jersey bi the Arthur Kill an the Kill Van Kull, an frae the rest o New York bi New York Bay. Wi a 2015 Census-estimatit population o 474,558, Staten Island is the least populatit o the burghs but is the third-lairgest in aurie at 58 sq mi (150 km2). The burgh is coextensive wi Richmond Coonty, an till 1975 wis offeecially the Borough of Richmond. Its flag was later chyngit tae reflect this, thou the offeecial seal remains unchyngit. Staten Island haes been sometimes cried "the forgotten burgh" bi inhabitants who feel neglectit bi the ceety govrenment. 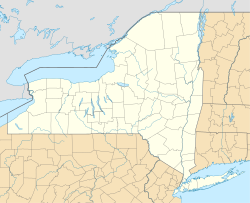 ↑ 1.0 1.1 "State & County QuickFacts - Richmond County (Staten Island Borough), New York". United States Census Bureau. Retrieved March 24, 2016. ↑ "Timeline of Staten Island - 1900s - Present". New York Public Library. Archived frae the oreeginal on January 13, 2006. Retrieved January 16, 2006. ↑ Brown, Chip (January 30, 1994). "Escape From New York - The New York Times". The New York Times. Retrieved January 14, 2008. Given their status as residents of "the forgotten borough" – the sorry Cinderella sister in New York's dysfunctional family – maybe the giddiest aspect of all was the attention. ↑ Buckley, Cara (October 7, 2007). "Bohemia by the Bay". The New York Times. Retrieved January 14, 2008. Even as New York’s hip young things invade and colonize neighborhoods near, far and out of state, Staten Island has stayed stubbornly uncool. It remains the forgotten borough. Wikimedia Commons haes media relatit tae Staten Island, New York City.